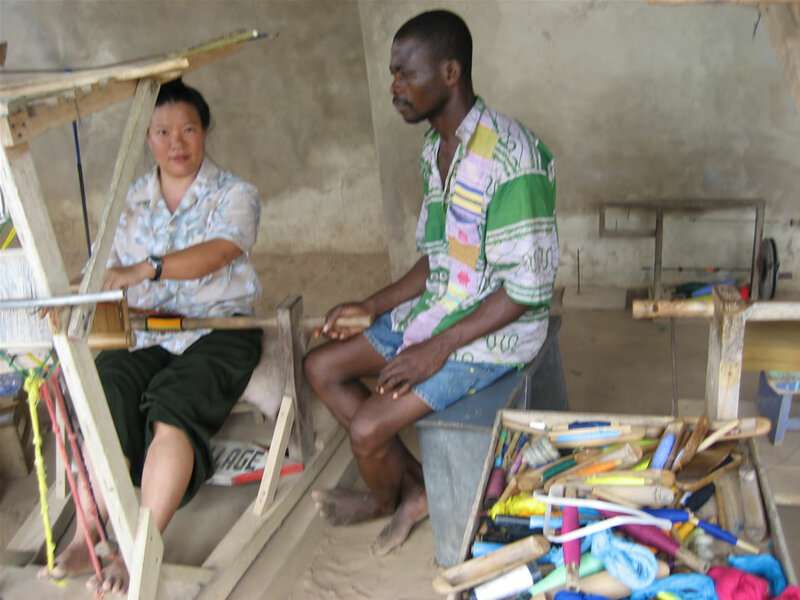 I was fortunate enough to spend 5 days in Ghana studying weaving with Kwame, a weaver from the Ewe (pronounced “ehh-way”) tribe.Â Kwame had 29 years of experience under his belt, and was a great teacher! It took me awhile to adjust to not having a fixed beater. 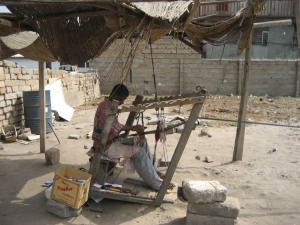 I was accustomed to a European-style loom (my Baby Wolf in particular), where the beater is fixed at 90 degrees to the fell. With more degrees of freedom, I quickly found myself beating the warp in unevenly, resulting in a convex fell (bulging out in the center). 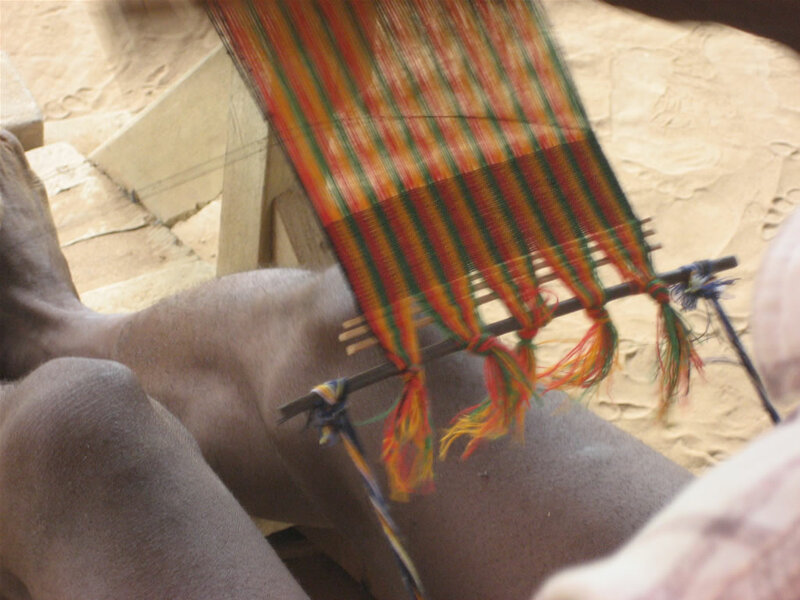 It took two or three feet of practice on simple plainweave to get it under control. The Ewe weaving I was taught used two pairs of shafts, one white pair which was used to weave pattern, threaded 1-1-1-1-2-2-2-2 (i.e. 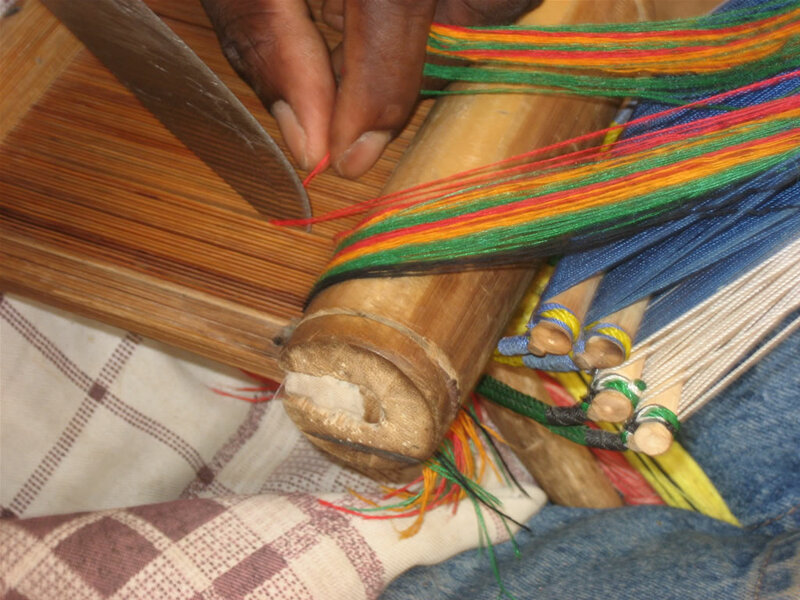 “plainweave” except with four threads in each heddle) with groups of four threads in each heddle, and one blue pair, which was threaded with single threads in a plainweave pattern. Each thread passed through both pairs of heddles. Given the threading and the sett (which I haven’t measured yet, but the thread we were using was roughly the weight of sewing thread), the plainweave sections came out as a balanced weave (equal parts warp and weft showing), while the pattern section, having 4 ends in each heddle, came out weft-faced, with no warp showing. Kwame showed me several supplementary-weft techniques, which I’ve shown in the photos below. 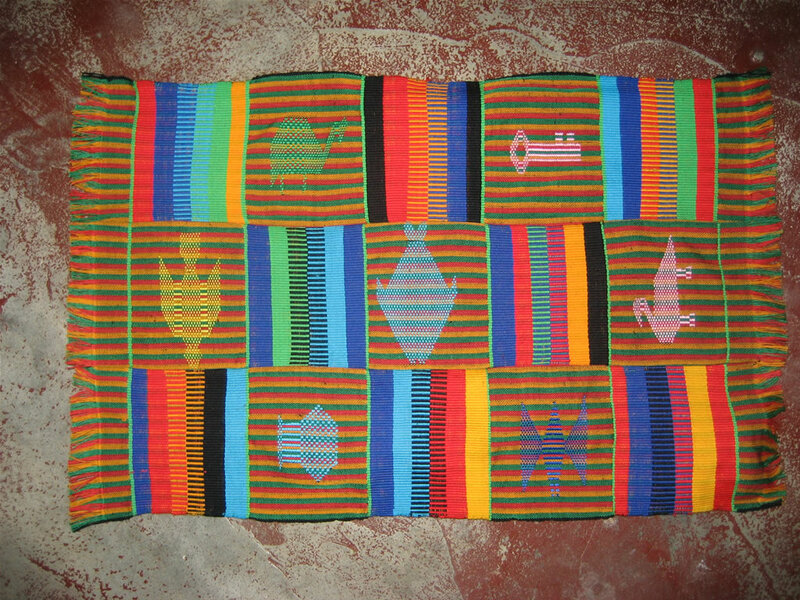 These, and a dizzying array of plaids, stripes, and bars, form the basis for the Ewe weavings I’ve seen. 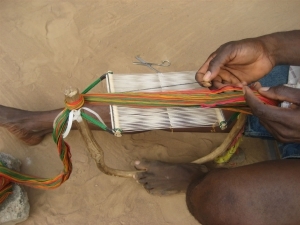 The techniques are relatively basic, and could probably be learned in a day or two by an experienced weaver. 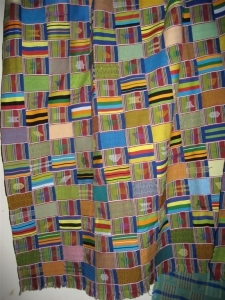 The magic of kente comes in being able to weave each pattern section so that it lines up precisely with the strip next door when it comes time to sew everything together. That takes experience and great skill. 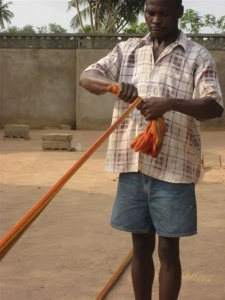 You can read more about my experiences in Ghana in the Ghana section of my travel blog. 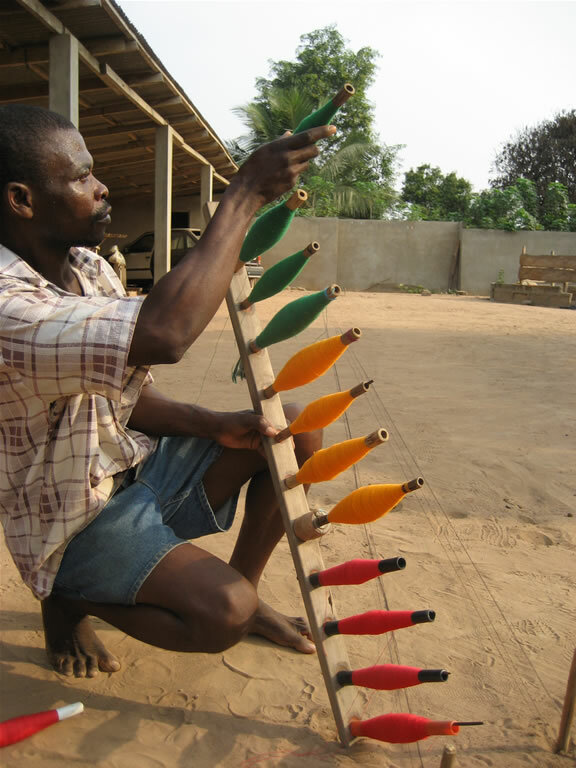 A rack of bobbins makes winding the warp a lot faster. The cross is hand-picked at the end. 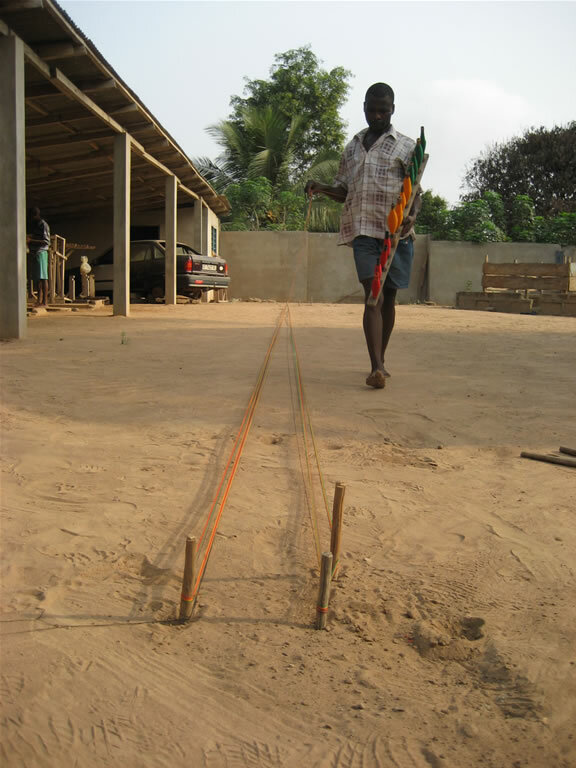 First, the warp is measured out on pegs stuck into the ground. 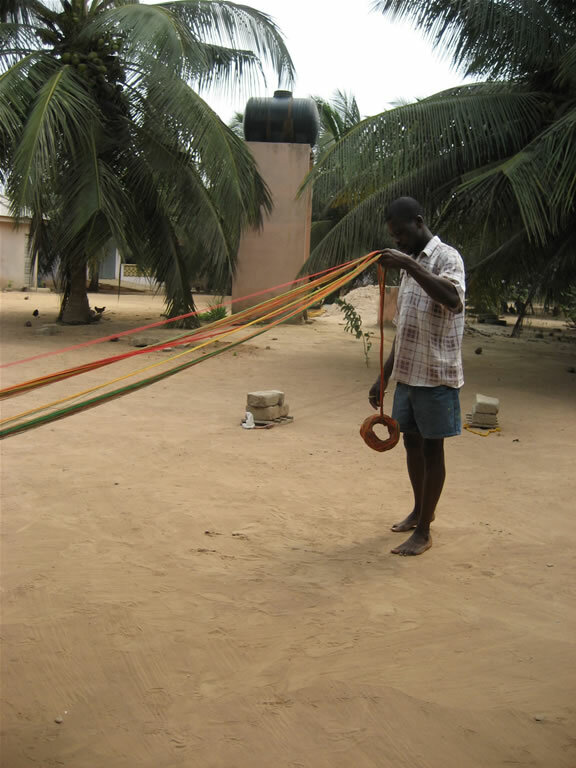 Warps are traditionally either cotton or a mix of polyester and cotton. The cross is made with two pegs in the ground. 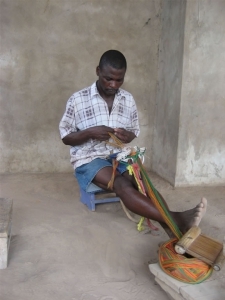 Kwame beginning to thread the heddles. 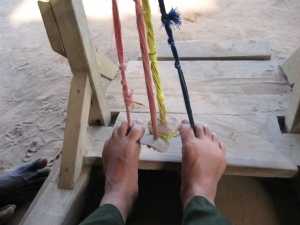 Threading from right to left, the right hand opens the top half of the heddle (from below the heddles), and pulls the thread down, then the left hand opens the bottom half of the heddle and a crooked forefinger pulls the thread through. 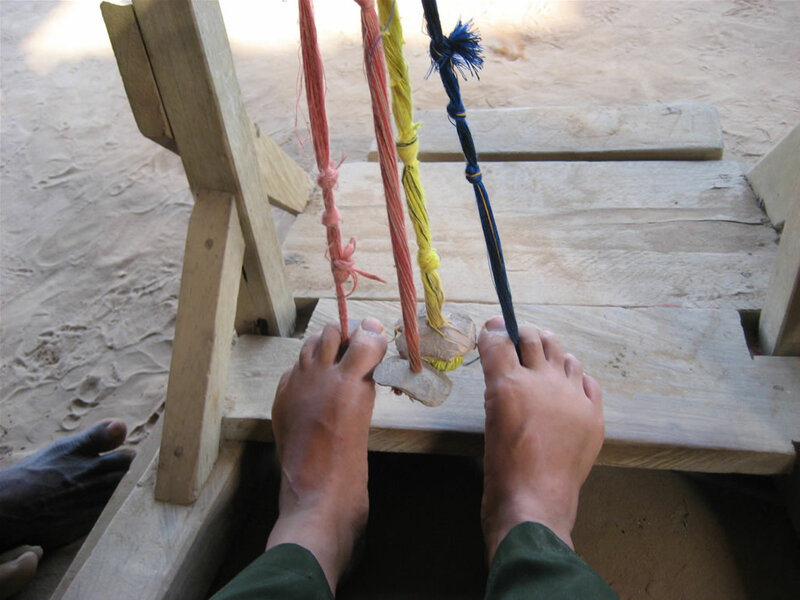 A flick of the right forefinger pulls the thread through and down. 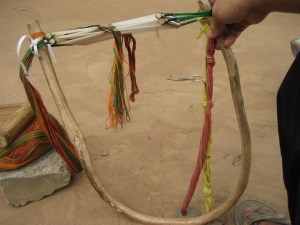 A closer look at the U-shaped stick that is holding the paired heddles taut. The reed. 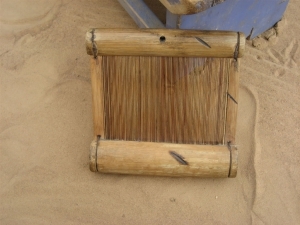 This is 5-6" across and probably about 18 dents per inch (possibly more). The warp is sleyed at roughly 54 dents/inch (220 ends in a strip 4" wide). Warp threads are roughly double the thickness of sewing thread, and are soaked in cassava starch to stiffen them before starting. 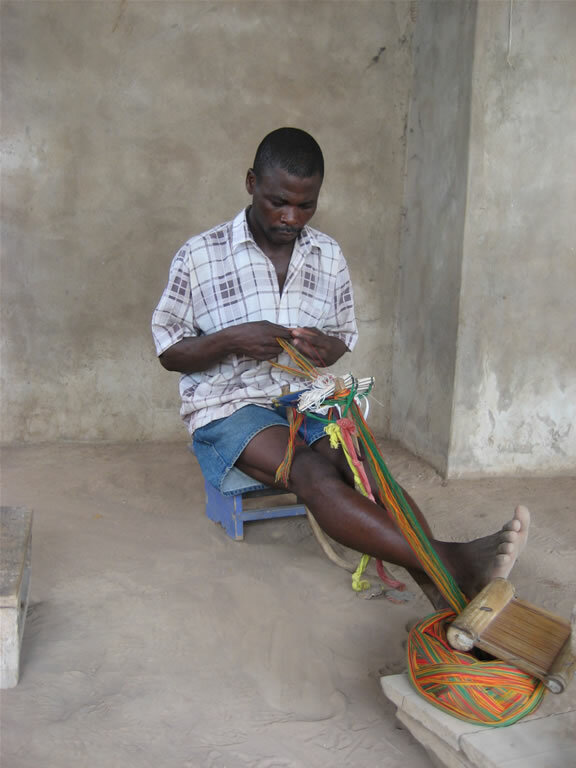 Kwame working on threading the heddles. The Ewe use two different harnesses on their loom. One pair of heddles weaves plainweave, the other pair weaves pattern. In my case we chose 4 threads in each heddle in the pattern-weave. Sleying the reed. 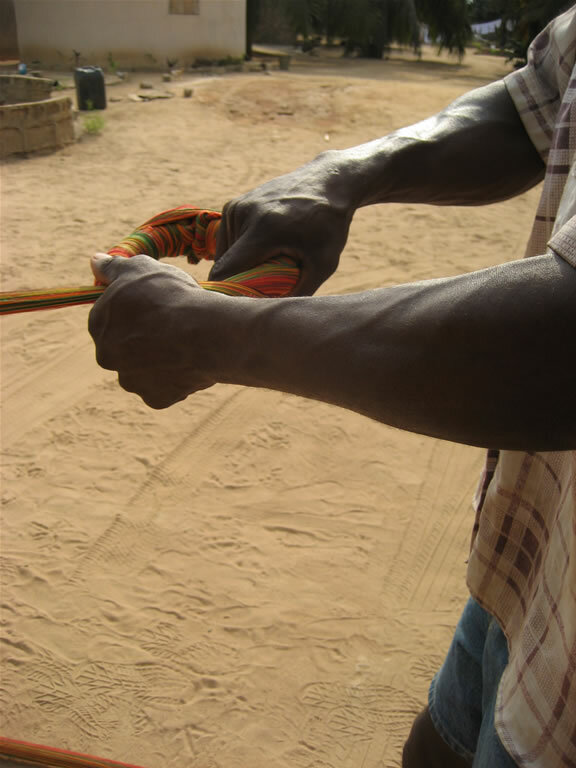 The thread gets wrapped around the back of a knife and is pushed through with a quick flick of the knife. The warp is placed some distance away, tied to a weight (see the large rock here). 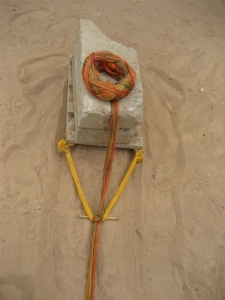 As the cloth advances, the weight is dragged along the ground. 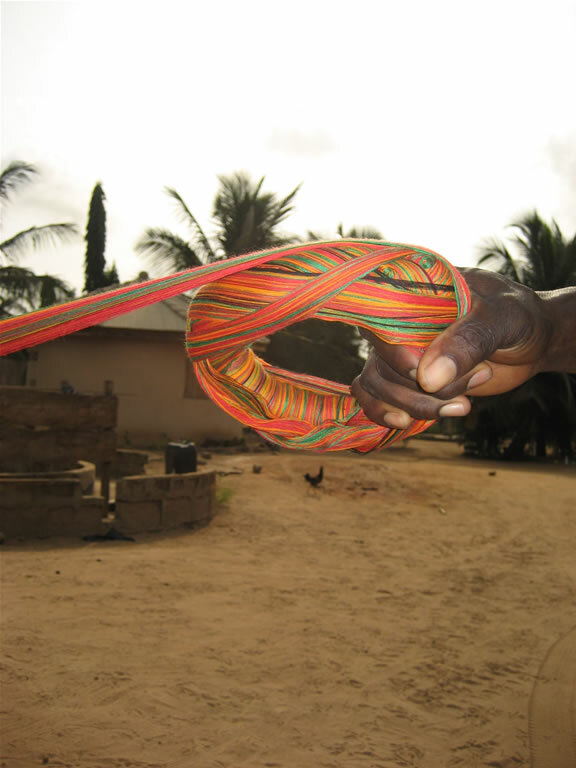 This keeps tension on the loom. A Ghanaian weaver sitting in his loom. 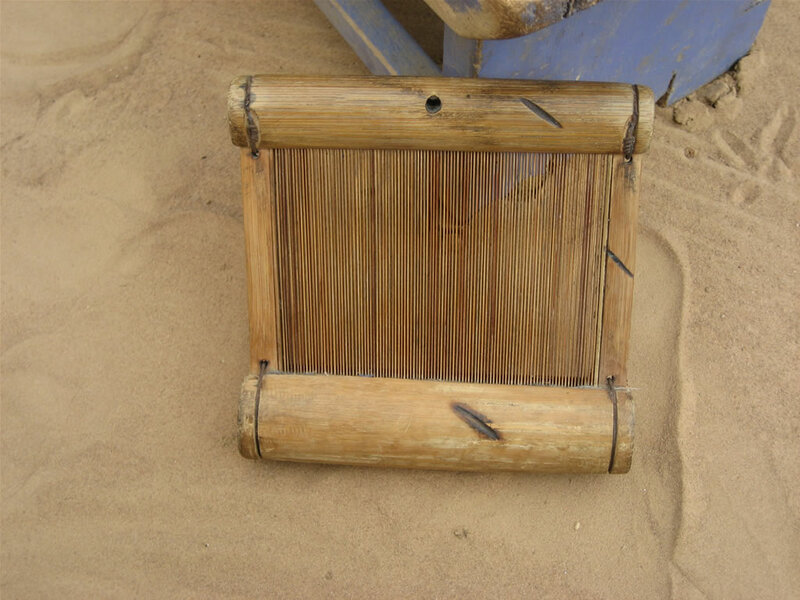 The scalloped top beams hold curved sticks from which the heddles and reed hang. He is sitting right up against the front beam, on which the finished work is rolled up. The warp is attached to a heavy weight ten to twenty feet away. 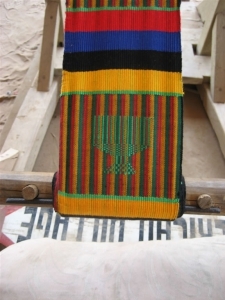 A kente made by my teacher Kwame. He says this one symbolizes "Unity". 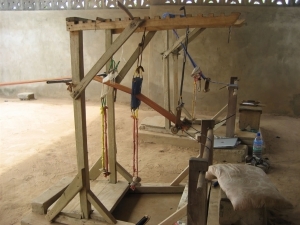 A photo of an Ewe loom.. From left to right, the white heddles (pattern weaving heddles), the blue heddles (plainweave threading), and the dangling reed/beater. A slightly better photo of the same loom. Notice the twin pieces of coconut shell hanging down from each pair of heddles; the weaver places the string between big toe and little toes, then pulls on the coconut shell to bring the heddle down and open the shed. 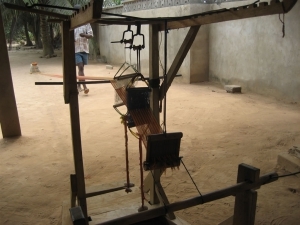 A front view of the same loom. Far in the background, at the end of the warp, you can make out the weight used to hold the warp taut. The placemat I wove on my last day of teaching. As the Mastercard commercial goes, "Placemat, $300. Five days of weaving with an Ewe tribe weaver, under the African sun: priceless." Me weaving on the loom, with Kwame watching. 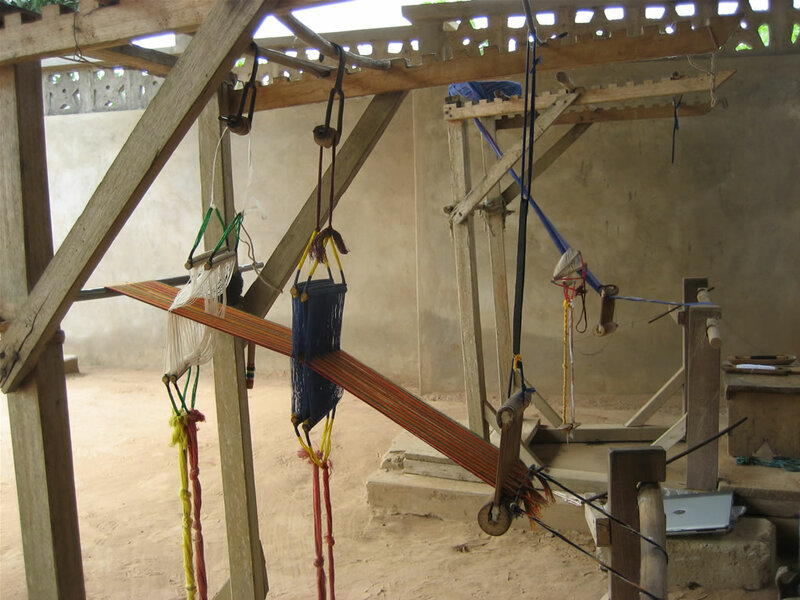 A close look at the "treadles". Each of my feet has a coconut shell between the toes! 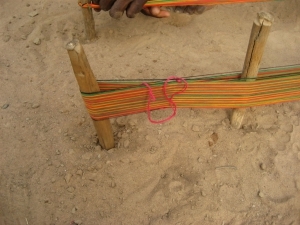 My first attempts at weaving. (Note the irregular stripes!) 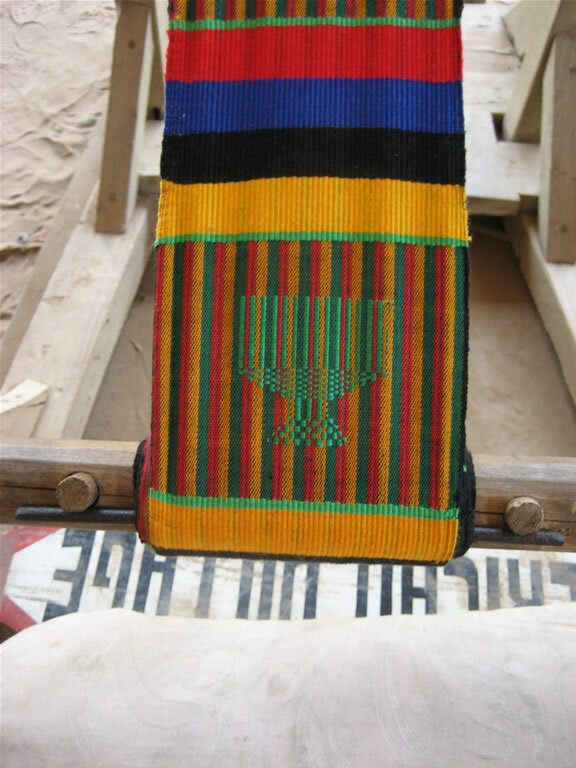 The vertical stripes are stripes in the warp, the horizontal ones are weft stripes. 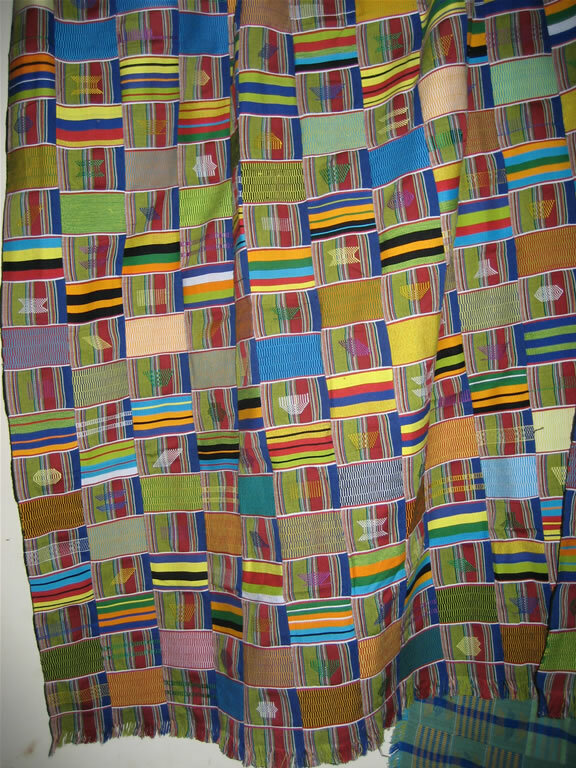 Warp is a mix of polyester and cotton, weft is traditionally cotton. Supplementary wefts can be rayon and silk. 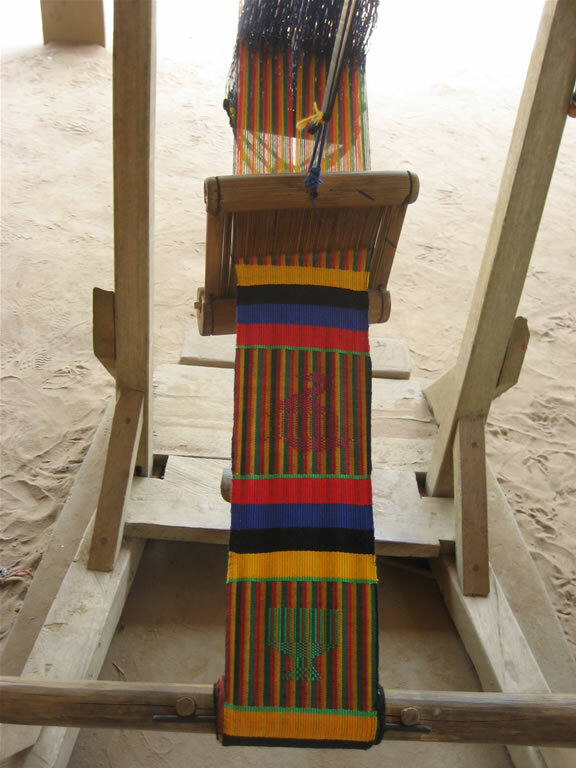 My warp was in stripes of red, green, and yellow, with black at the selvages. 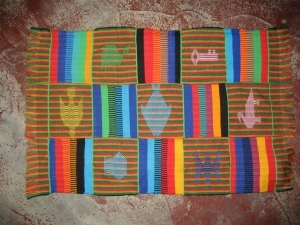 A closer look at one of the supplementary-weft patterns (this one is a hair-comb). These are done on a plainweave background. A sword is used to establish a shed using the pattern heddles, and then the exact pattern is picked out by hand. Zero, one, or two tabby (plainweave) shots are thrown in between supplementary-weft shots, depending on the pattern. The warp threads were sticky and tended to clump together, especially when switching from pattern to plainweave. 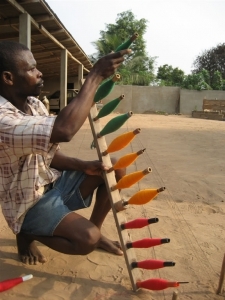 To help with this, Kwame would wax the warp threads using the side of a candle.